To improve efficiency of translanting operations several devices have been developed. Removal of plugs from a plug tray can be difficult. The degree of soil moisture content and compaction, the size of the plug and the size of the cell affect the withdrawal resistance. A large root system that protrudes through the drain hole or has grown into adjacent cells can also affect removal. Too much resistance increases potential for root and stem damage. Automated transplanters usually have a device that loosens the plugs before transplanting. Several manufacturers have developed devices that loosen plugs for hand transplanting. There are two main types, pin plates and air manifolds. Pin extractor - The plug tray is set on a frame containing a steel plate with holes to match the plugs. A hold-down assembly, usually with a set of pins is brought down to keep the plug tray in position during extraction. This assembly has to have pins that match the spaces between the plugs. A pin plate is located underneath the plug tray. It has pins that match the drain hole locations in the tray. Either a manual hand or foot lever or pneumatic cylinders pushes the pin plate up forcing the pins through the drain plug holes and dislodging the plugs. The distance traveled can be regulated. Trays with different hole configuration require a different support plate, hold-down assembly and pin plate. Cost of this type extractor varies depending on the number of tray sizes you have. Also the more cells in the tray, the greater the cost. 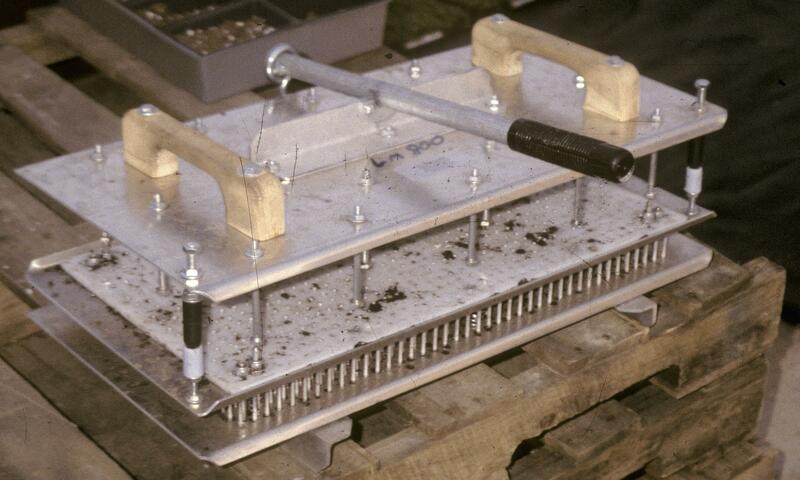 Air extractor - In this device, the plug tray is slid over a manifold with holes to match the cell spacing in the tray. The air passes through the drain hole in the plug tray and dislodges the plug. The manifold has several hole spacing to accommodate different tray sizes. One row of plugs is loosened at a time. A frame supports the tray over the manifold and a cover holds the tray down and catches any plugs that pop too far. Air pressure can be varied to match the size of plug. 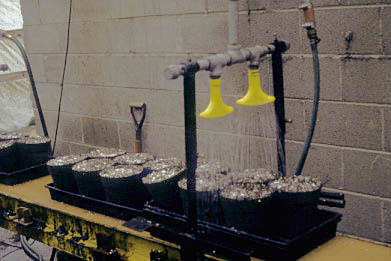 Once the seedlings are transplanted, they are usually settled in with water. This gives the root system of the new plants good contact with the growing media and helps to give them a quick start. For small numbers of plants this can be done by hose and water breaker. When a transplanting table or automatic transplanter is being used, it saves labor to use a watering tunnel or water bar. Besides saving considerable time, a watering tunnel can do a more uniform job of wetting the container after it has been transplanted. Watering tunnels are designed to irrigate flats or pots held in a carrier or hanging baskets. Water nozzles are mounted above a chain or polycarbonate perforated conveyor belt that is powered by a variable speed motor. Side panels and a tray or tank below the belt catches excess water and directs it to a drain. A solenoid valve activated by a photoelectric eye or finger switch turns the water on when a container approaches. Water application rate depends on the type and spacing of the nozzles. Some manufacturers provide several stages to avoid washing out the seedlings or plugs. In an alternate design the conveyor carries the transplanted flat through a tank of water. Many growers have developed their own tunnel or bar. A simple system consists of a set of water breaker nozzles mounted over the conveyor. A finger switch or photoelectric eye activates the solenoid when a flat passes by. The type of tag or label used. The time and labor available. The needs of the retail outlet. The information that is contained on the label. Adhesive backed. These are usually attached to the container just before they are shipped to the garden center or retail outlet. They require a dry clean surface to adhere to. Insert tag. The most common identification for bedding plant packs and pot plants. These can be inserted during the transplanting process or just before shipping. Wood, paper and plastic is available in several sizes. Slip-on. These are designed to be pushed onto the stem or branch of a plant such as houseplants or nursery stock. Elastic band. The elastic band is placed around the stem or a branch of the plant. Wrap with staple. These are used mostly with larger nursery stock, wrapped around the stem and then stapled. Tags and labels should contain information needed for marketing the plants as well as informing the purchaser how to plant and care for them. Because of the size, information must be concise. Tags and labels may contain just the name of the plant or it may contain information on planting, pruning, feeding, watering, ideal location and harvesting. They may also contain a product number, SKU number, UPC code, purchase number and a price. Printers are available that will print a color picture of the plant in bloom. Tags can be purchased pre-printed from most greenhouse suppliers. There are also several computer controlled label printing systems that allow you to create your own labels. The labels may be handled individually or as strips. These can be printed as needed which helps to reduce inventory. The computer can store the information on a label for retrieval at a later date. Tags are usually kept in a storage area near the transplanting or shipping area. A separate room or area is needed that is convenient to where they are used. In the nursery, the tags may be stored in a separate building or storage trailer. Within the storage, the tags may be stored in boxes or bins on steel racks. Some growers have adapted a plastic or corrugated bin box system available from industrial equipment suppliers. These are low cost and have space to identify the contents on the front of individual boxes. Grouping by cultivar helps to speed selection. There may be several thousand different types of labels needed to identify the varieties and sizes of plants grown. Workers must be able to locate and identify the appropriate tags quickly. Tagging can be done in the transplanting area, the growing area or before the plants are shipped. It generally takes more time to do it during the shipping step. Tagging 5 or 10 plants of a variety requires locating the proper tags, and then keeping each variety separate. The type of tag/label used influences the rate that they can be applied. Adhesive backed labels are the easiest to use. They are pealed from a sheet and stuck on to the side of the container. Insert type tags stick into the soil in the container. The heavier the tag, the easier they are to use. Wrap (slip-on) type labels, because they are printed in strips, usually have to be separated before they wrapped on to the plant. Labels with an elastic band are also more difficult to get over the branches of the plant. Some wrap type labels require stapling. This takes additional time as the stapler has to be picked up for each label. The speed of labeling when using a conveyor for plant handling or loading is governed by the conveyor speed and the plant spacing on the conveyor. Tagging machines were developed to reduce the time associated with hand tagging. They are operated in conjunction with potting machines, transplanting conveyors or automatic transplanters. The tagger is usually located over a belt conveyor with the pots or flats passing under one or more tagging heads. The tags are held in a magazine or chute and fed to an insertion head. As the flat or pot comes under the head, the container is positioned and a microswitch or photo-eye activates the head and the tags are inserted. Most machines can insert several tags at a time across a flat. Compressed air and/or vacuum is needed depending on the manufacturer. Control may be manual or by a preprogrammed solid state device. With a controller the flat or pot configuration is entered and the tag chutes positioned. Some manufacturers have stop signals to indicate when the tag supply runs out. Most machines are designed to handle several styles of insert tags. The machine will handle at least 500 flats/hr.